Having trouble getting started on Etsy? 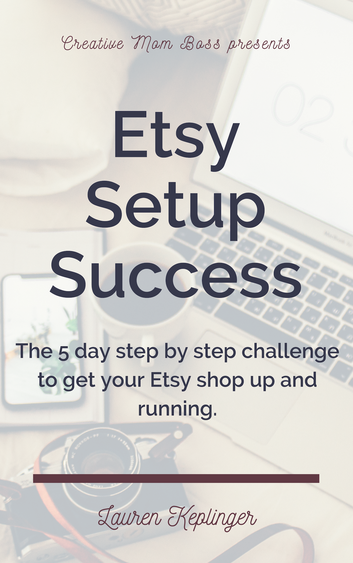 Get access to this *free* 5 day series and get your shop up and running in the next week. We won't send you spam. That's not our jam. 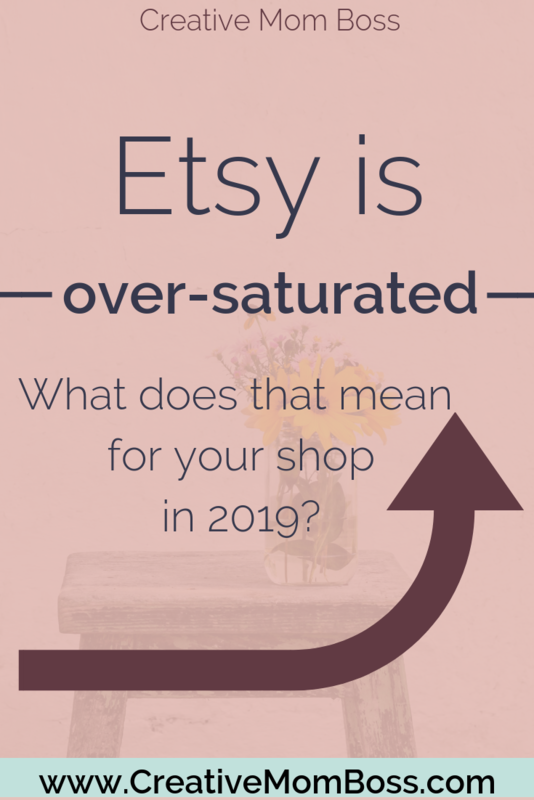 Is Etsy Oversaturated in 2019? Is it too late to get started with a handmade business in 2019? Maybe you have a great creative idea that you can’t wait to share with the world. You get started, making some examples to share with your friends, and get excited about the idea of a new online venture. But then you log on to Etsy and you figure out that everything that you want to do has already been done before. That great new idea or the next big thing is actually already out there. Someone else is doing it, and may even be doing a really good job at doing it. Does that mean it can’t be done again or that there is no room in the marketplace for you to be successful on Etsy as well? Does that mean that Etsy is oversaturated and there’s no room for your business? I hear this all the time, and it is one of my favorite rumors to squash because I believe so fervently in the fact that there is still SO much opportunity that exists on Etsy and so many reasons to get started selling online and creating the online business that you’ve been daydreaming about. Let’s face it, in 2019 Etsy does have a lot of offerings for sale - just like all of retail or ecommerce. As consumers, we are constantly bombarded with new products, new ideas, new services, and new people selling to us all day long every single day. But does that mean that Etsy in particular is oversaturated or that you cannot start a business and grow it to an income that makes a difference for your family? The answer is definitely no. Etsy has over 35 million buyers, and less than 2 million Etsy sellers. Those numbers are growing every day, which means that there are plenty of people to buy your products. More and more people are shopping online everyday, and the ability to source things from all over the world is a huge benefit. I don't see the tides of e-commerce changing back to buying at the lowest price at big box stores. If anything, I think consumers are more and more invested in the impact that their purchase makes (think brands like TOMS shoes or Warby Parker glasses) and running a small business that has a direct impact on your family falls in line with that trend. I love Etsy for a variety of reasons, but mostly because I’ve never had sales anywhere online like I’ve had on Etsy, and Etsy allows me to actually build a brand of my own rather than just selling on off products to people who don’t even realize who they are buying from. Etsy has the largest traffic base of any handmade marketplace on the internet. There have been other competitors that have sprung up in the last few years, such as Amazon Handmade, but no one can really compare with the original vision of Etsy - which was a handmade online marketplace. Obviously Amazon has an overall larger audience, but the vast majority of Amazon shoppers are coming to Amazon to buy something specific - and not handmade. Lots of people don’t even really understand the selling side of Amazon, and don’t realize that they are buying from a small business or a separate entity other than Amazon itself. Etsy’s audience is looking for the things that Etsy is known for - vintage, handmade, supplies, and personalized items. While you should always strive to bring your own traffic into your business and not ONLY rely on Etsy to bring in the traffic for you, driving your own traffic to your site can be very difficult and expensive, especially when you are just getting started. It is totally possible to have a very successful, highly profitable business just from the traffic that Etsy brings in. While I wouldn’t recommend basing your whole business model on that forever, it is a fantastic place to get started. Having Etsy’s built in traffic drive buyers to your shop allows you to get some momentum going with your business so that you can get some sales under your belt and have a little financial breathing room to reinvest in your business. Etsy also gives you the ability and freedom to brand your shop outside of just being “an etsy shop” on the platform. Having a banner at the top, your own policies, the ability to have FAQ, your Etsy avatar, etc all contribute to your own branding and brand identity within the platform. I think that a lot of new sellers have trouble wrapping their heads around why this is important, but as you get more well-versed in selling online and you have developed your brand in a stronger way, it becomes very important to have a brand identity that is not just another Etsy shop, or worse, just being bought on Amazon and not having any branding at all. Etsy can completely change the future of your business, or the business that hasn’t even been created yet but you are dreaming about. With just a couple hundred dollar yard sale embroidery machine and a .20 listing fee, I had a business that has grown to over $14,000 in monthly revenue - and that is the amazing part of being an internet entrepreneur in 2019. That opportunity hasn’t passed you by. Etsy is NOT oversaturated, and there is still the chance to build the business that you are wanting. There is more than enough opportunity to go around -- it is your time to grab ahold of that opportunity and go for it. If you’re wanting to get started on Etsy, download the Ultimate Etsy Starter Kit - my 10 page guide to getting started on Etsy, myth busting my favorite misconceptions about the platform, and my top apps for marketing. Should I use vacation mode on Etsy? What kind of Etsy seller are you? Ready to make the full time income leap? I’ve got you covered. Sign up to instantly receive my 10 page Etsy Ultimate Startup Kit to take to drive more traffic (and sales!) to your shop today. (c) Creative Mom Boss, LLC. All rights reserved.